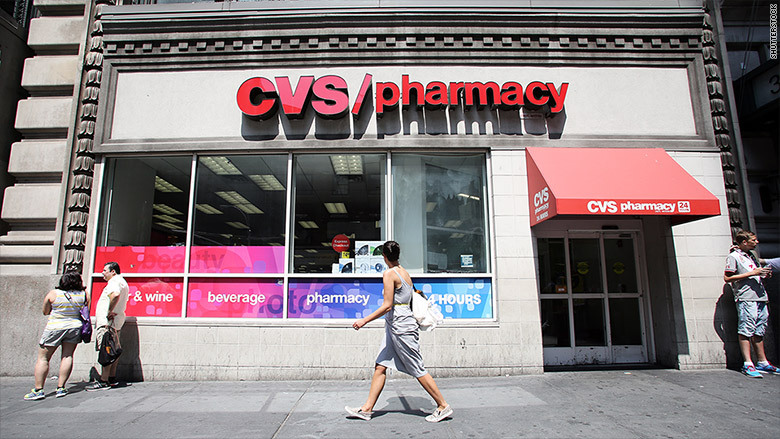 CVS just got sued for allegedly overcharging for generic drugs. CVS is overcharging customers who have insurance by "fraudulently" jacking up prices on prescription drugs, while those with cash are paying much less, a lawsuit claims. "CVS knowingly and intentionally overcharged pharmacy customers for generic prescription drugs by submitting claims for payment to third-party payors and fraudulently inflated prices," reads the lawsuit, filed Thursday in federal court in California. In one example, the suit accuses CVS (CVS)of charging $135 for a 90-day supply of a generic version of Fosamax, which is used to prevent osteoporosis, while customers paying in cash for the same drug were charged $12. "CVS's false and deceptive pricing scheme caused CVS pharmacy customers who purchased generic prescription drugs through third-party plans to pay significantly more in copayments than CVS charges cash-paying customers to purchase the same drugs," reads the lawsuit. The lawsuit was filed by seven customers from different parts of the country who are seeking "monetary damages." CVS, which recently announced a $2 billion deal to buy Target's (TGT) pharmacies, did not immediately respond to messages from CNNMoney. However, company spokesman Michel DeAngelis said that CVS hasn't been served with the lawsuit so he couldn't comment on it. He also said that co-pays are determined by a patient's prescription coverage plan, not by the pharmacy, and that a similar lawsuit in Massachusetts was dismissed.